Hire heroes of legend and build great capitols to expand and change the face of Catan forever! The small island nation of Catan is no longer a footnote on the maps of the world. The men and women who have tilled the soil and farmed its lands have brought forth a bounty large enough to support a growing population and a healthy economy rivaling those of its larger neighboring nations. But it was not through the work of farmers and ranchers alone that raised a handful of colonies into a thriving world power. Scattered among the towns and cities are monuments to the heroes who lead the people and protected them through trials and tribulations. Now you have a chance to relive these epic tales and breath new life into long-lost legends of old. Heroes & Capitols, by DisbeZO’s Games, is a fan created expansion for The Settlers of Catan and is comprised of 36 Ship cards, 45 Event cards, 20 Hero cards, 6 Legend cards (used as player aids), 1 Largest Fleet card, 6 wooden Capitols, 8 Damage chips (4 in red, 4 in blue), 2 six-sided dice (1 in blue, 1 in black), and 15 Weapon cards. 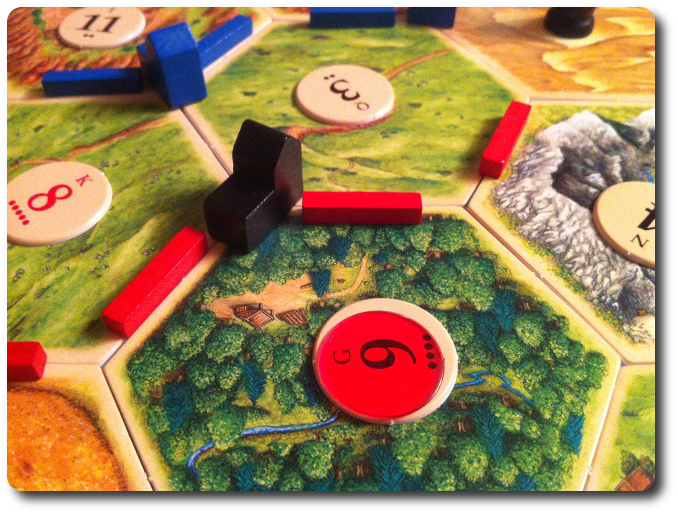 Note: The Settlers of Catan, which is necessary to play this game expansion, is referred to as the “base game” for the remainder of the review. To set up the game, first complete the necessary steps for the base game set up. Second, separate the cards by type to create four decks (1 Event deck, 1 Hero deck, 1 Weapon deck, and 1 Ship deck). Shuffle these decks thoroughly. Set these four decks to one side of the game board and within easy reach of all the players. We suggest you place these decks next to the Resource cards. Third, give to each player 1 Legend card. This card shows what resources are needed to build Ship, Hero, and Event cards, as well as what is necessary to build a Capitol. Fourth, set the Largest Fleet card next to the base game’s Longest Road and Largest Army cards. Fifth, set the Capitols, the Damage chips, and dice to one side of the game board and within easy reach of all the players. 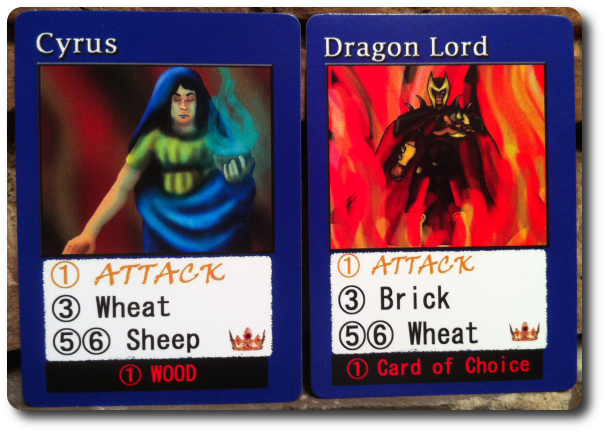 The Hero deck contains 20 remarkable individuals who can be purchased for 2 Bricks and 1 Wheat on a player’s turn. Heroes help the player’s growing colonies by using their influence to collect more resources and attack the competition. Once a Hero card is in play, the player is awarded the blue six-sided die to roll on their turn. This die is rolled at the same time as the base game dice. The number value rolled on the blue six-sided die is matched to the Hero card. There are three important groups of numbers. Attack: if this value is rolled, the Hero can be used to attack another player who does not currently have a Hero in play. A successful attack results in the player taking one card at random from their targeted opponent. Gather Resources: if this value is rolled, the Hero awards one Resource card of the noted type for the player. Special Ability: if this value is rolled, the Hero awards an improved benefit to their owning player. The special ability is only available if the player has built a Capitol. All the Heroes are different and provide different resources. A player can purchase as many Heroes as they like for as long as there are Hero cards to collect; however, a player can only have 1 Hero card “active” at a time. A player can switch which Hero is active at anytime so long as it is before they roll the dice on their turn. The Ship deck contains 36 cards with a number value ranging from 2 to 12. These values can be used instead of rolling the dice on the player’s turn. To do so, however, the player discards the Ship card. 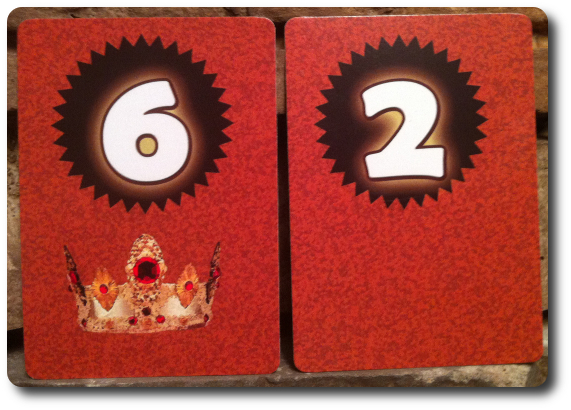 The numbers shown on the card are used in the exact same way as a dice roll of the same value. Additionally, some of the Ship cards have an image of a Crown, a Compass Rose, and a Road. Instead of discarding the Ship card for the number value listed, the player can discard it to collect what the image represents. The first player to collect 3 Ship cards is awarded the Largest Fleet card. Like the Longest Road and Largest Army cards, the Largest Fleet card is immediately collected by the player who has the most Ships vor a victory point. A player can purchase the Ship cards by spending 2 Wood and 1 Sheep on their turn. Each player has the opportunity to build 1 Capitol during the game if they choose to. To build a Capitol, the player must spend 1 Ore, 1 Brick, 1 Wood, 1 Sheep, and 1 Wheat and already have a City in play. Once built, the Capitol replaces the City piece, is worth 3 victory points, and collects 2 resources. Additionally, because of the Capitol’s size and defenses (being the central seat of all government authority), it cannot be damaged or reduced in size by any player. On the player’s next turn, they get to roll the black six-sided die. The Capitol is capable of producing 1 Resource per turn or attacking an opponent who does not have a Capitol in play (allowing the player to steal 1 card). 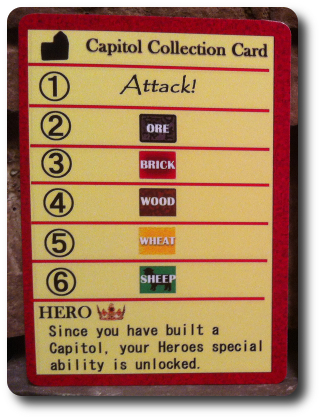 The resource the Capitol creates is based on the die roll and is matched to a chart on the Legend card. If a player has any Heroes, the Special Ability of every Hero can now be used if rolled. The Event cards will alter the island nation of Catan for better or worse. 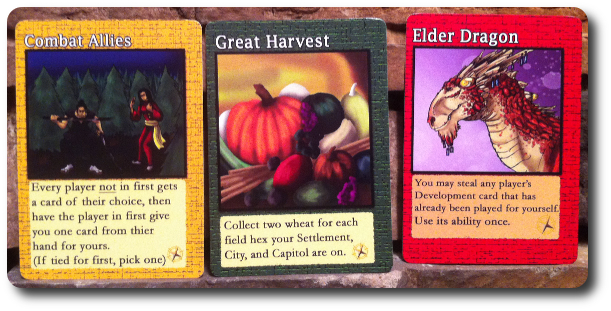 The Event cards represent three types of events: growth, destruction, and defense. 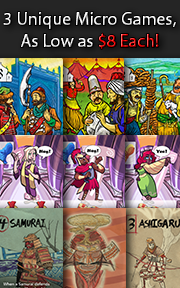 The growth Event cards are beneficial to the player and allow them to collect more resources and victory points. The destruction Event cards will temporarily remove resource locations on the map via natural disasters (red chips represent fire and blue chips represent flooding), harming one or all the players. The defense Event cards change victory conditions and alter player advancement, thus shifting some of the power gained by the more skilled players to the lesser skilled players. Effects from an Event card can be canceled out by die rolls and by other Events (for example, a flood cancels out a fire), allowing other players to play Event cards to restore the natural balance of the board to its normal state. To purchase an Event card, a player must spend 2 Sheep and 1 Ore. However, the cards drawn are random, as are the effects. 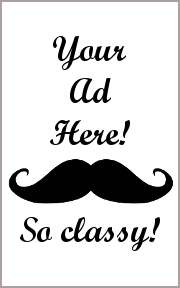 To buy an Event is to play with fate. While the Heroes, Capitols, Events, and Ships are all required to be used if playing with the expansion, the Weapon cards are not. Weapon cards are purchased by sacrificing an unused Event or Development card and the player must have a Capitol or Hero in play. Like the Event cards, the Weapon cards will either benefit the player or harm them. Unlike the Event cards, Weapon cards will only affect the player who purchases them. Once a Weapon card is purchased, the player flips over the top Weapon card on the deck and reveals it. This card is then considered “in play” for the duration of the game. Sometimes the Weapon card will allow the player to use it when they want and sometimes it will force the player to take an action immediately. Thematically speaking, think of the Weapon cards as a symbolic action of building weapons and starting a war. Not all wars go well for those who start them. The bonuses earned from the Weapon cards are given because the player was lucky in battle, while the penalties are the results of failed battles. 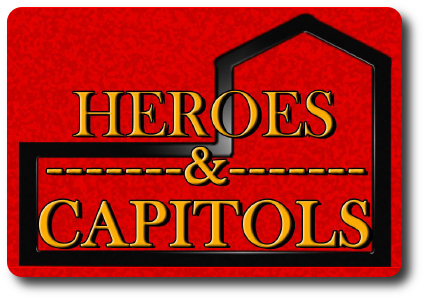 To learn more about Heroes & Capitols and read the full rules, see the game’s web page. My little geeks already enjoy the base game, so it is without much thought I believe the expansion will also be enjoyed. This is for two important reasons. First, the expansion does not add an abundant number of new rules to the game which will make it easy for players already familiar with the base game to start using the expansion with little issue. Second, the expansion adds a layer of epicness that is missing from the base game. Specifically, heroes, dragons, and natural disasters that I am sure will be a hit for the little geeks. I don’t think the Parent Geeks will reject the expansion, but their level of love for it might only border on acceptance versus the high level of excitement I am expecting from the Child Geek group. The Gamer Geeks will certainly appreciate the changes in the game, but I am not certain if the expansion provides enough in the way of meaningful new strategies and tactics to make them take much notice. Without a doubt, however, I don’t believe any of the test groups will flat-out hate it. As expected, teaching the expansion takes very little time. For the Child Geeks, I focused on the use of Heroes and avoided adding in the Weapon cards. For the Parent Geeks, I took only a brief explanation of each of the card types and what they provided before everyone was ready to go. For the Gamer Geeks, I just pointed to each deck and noted if it provided victory points or resources. For all groups, less than 5 minutes was needed before everyone was ready to play. And so, while I reset the decks for our first game with the expansion, I asked my little geek his thoughts on it so far. Good deal! He is already considering how he can use some of the cards to his benefit! Let’s see if the expansion adds new life to the game or if it is the proverbial nail in the coffin. Without a doubt, Heroes & Capitols was a great success with the Child Geeks. They immediately gravitated to the Heroes and made excellent use of the Ship cards to avoid the randomness and disappointment of bad dice rolls. My little geek was an absolute Hero hoarder and used them as one would use different pieces of equipment. If he needed more brick, he’d bring out his Hero who provided it. If he needed more cards, he’d equip that Hero instead. He used them brilliantly and was never short on resources he needed, which made it maddeningly difficult to trade with him. After each game, he enthusiastically always gave the game expansion a solid thumbs-up. Parent Geeks also enjoyed the expansion and made excellent use of the Ship cards. One of the non-gamers used the Ships so well, the dice rolls were always going their way. The Event cards were perhaps the most unloved of the expansion game components as they tended to make the game play a bit more complicated than everyone at the table wanted. These cards were easily ignored and did not disrupt the use of the other expansion cards whatsoever. One Parent Geek noted, “this should be included in the game right from the start.” I agreed. Gamer Geeks were pretty ho-hum about playing The Settlers of Catan to begin with and were neither pleased or displeased by the game expansion. According to one Gamer Geek, “the expansion just adds more ways to collect resources”, which is a true statement. Then one of the Gamer Geeks got the idea of playing the Event cards and everyone at the table leaned in a bit closer. With the Event cards in play, suddenly whole parts of the board were on fire, under water, or a serious threat to the other players’ ability to win the game. The Heroes came out fast as additional batteries to provide necessary resources and the Capitols were built shortly thereafter. Very quickly, the Gamer Geeks changed their tune about the game expansion, but it did little to improve their love of the overall base game. Gamer Geeks, this is a solid expansion that provides the players different ways to customize their resource gathering. This was, in itself, noteworthy enough for the Gamer Geeks to give it a nod of approval. The Ship cards were also well received as they provided not only a means for more victory points but also a way to control the dice rolls at key moments in the game. The Event cards were more or less just seen as temporary game changers and enjoyed by those who either needed to slow down their competition or bother them. If you enjoy The Settlers of Catan, you’ll enjoy this game expansion. Parent Geeks, this is a fun and easy game expansion to add to the base game that will not upset game play or make the game difficult. It is an easy add that provides all the players with more options without increasing the game’s length. Non-gamers greatly enjoyed it and so did the Child Geeks, making this a winner for family game nights. Child Geeks, this expansion is perfect for you. It can be very frustrating to play the base game against more skilled opponents as they tend to take the best spots on the board. This results in the rest of the game being an exercise in scrapping for resources. With Heroes, you can now take matters into your hands and start to focus on those resource you need, as well as attack those opponents who you think need a reminder that Child Geeks are good gamers, too! Heroes & Capitols does exactly what an expansion should: expand the game. It builds off the already solid foundation of the base game to introduce new game elements that can be used by the players, or if so desired, completely ignored without penalty or disadvantage. The expansion does not change the game’s base rules to a point where the entire game needs to be relearned, and what it adds to the game is easy enough to explain in 5 or so minutes. Most importantly, it provides the players with meaningful and interesting new choices. Each player is most welcome to ignore the expansion if they already have a strategy in mind, but for those who do not or for those who are looking to explore new paths to victory, Heroes & Capitols provides new opportunities that are fun and easy to use. Of all the new cards the game expansion provides, the Weapon cards were the weakest. This is a good thing as they are considered optional. I put them out with the games but they were never utilized. Indeed, all it took was one player to draw a bad Weapon card and everyone else avoided the deck from then on. The cost to purchase the Weapon cards is also pretty high, despite the possibility of getting something good. Other than the Weapon cards, all the other game expansion bits were fully used, loved, and made for a much more interesting and enjoyable game. Personally, I’m never playing The Settlers of Catan without Heroes & Capitols again. The expansion is now part of the base game, as far as I’m concerned. It breathed new life into a game that I found old and tiresome, albeit a good game to continue to own. With more choices, I found myself more engaged in the game and with the other players. Each Hero was different, gave me different options, and the race to build a Capitol for even more advantages made the game much more competitive. I really couldn’t tell you if the game length increased or decreased because I was having too much fun playing the game to keep track of the time. I also feel somewhat compelled (because it became a topic of much discussion during our play sessions) to state the game’s title does not include a misspelling. A “capital” is a region’s or country’s most important town or city and a “capitol” is a seat of governmental power. I know, confusing. English can be something of an irksome language, especially here in the United States where a capital and capitol are one and the same. While the language and term is correct within the scope of the game, it didn’t stop Parent and Gamer Geeks to debate its use, which was also irksome. In the end, we all agreed to roll our eyes at the disagreeing party and just play the game. If you are a fan of The Settlers of Catan and are looking for a fun expansion that adds new ways to collect resources and victory points without adding complexity, do include Heroes & Capitols in your next play session. Tagged Father Geek Approved, Game Expansions, Gamer Geek Approved, Parent Geek Approved. Bookmark the permalink. The game expansion will do two things right off the bat. First, it will reduce the level of luck needed to play. Focus is instead placed on better use of resources, which can or cannot be used to purchase Hero, Event, Ship, and Weapon cards. Second, while dice are still used throughout the game, the use of dice now become more fun as the Capitols and Heroes provide random bonuses and also allow players to influence large chunks of the board to address Events. We greatly enjoyed the game and I can see myself playing The Settlers of Catan more often as a result. At this time, from the Game Crafter.